HELENA, Montana, February 15, 2011 (ENS) – Montana Governor Brian Schweitzer today signed an executive order stopping the importation of Yellowstone bison exposed to a livestock disease into the state of Montana for 90 days. This action grants a stay of execution to 217 bison, also called buffalo, that have tested positive for the infectious abortive disease brucellosis. At least 525 bison are currently being held in the Stephens Creek bison trap on the Yellowstone border, because Montana ranchers fear the wild bison will transmit the disease to their livestock, imperiling the state’s brucellosis-free status and making it impossible to sell their cattle. 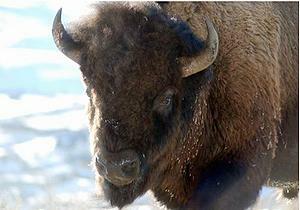 The Yellowstone herd of about 3,500 animals is the only continuously wild population of American buffalo that remains. About half of all Yellowstone animals carry brucellosis, says the executive order, and Governor Schweitzer said he is using the executive order to send a message to the Obama administration that the 10 year old Interagency Bison Management Plan is not working. State Veterinarian Dr. Marty Zaluski said the U.S. Department of Agriculture is currently reviewing its approach to brucellosis management nationwide. “The proposed concept would de-emphasize state status and allow brucellosis to be managed on a case-by-case basis,” he said. On Monday, U.S. District Judge Charles Lovell issued a ruling denying a request from sportsmen, Indian tribes and environmentalists for a restraining order to stop the bison kill. “Distasteful as the lethal removal may be to some, it is clearly one of the foremost management tools, time honored, necessarily utilized to protect the species, the habitat, and the public,” Judge Lovell wrote. An attorney for the plaintiff group Western Watersheds Project said an appeal is planned. The plaintiff groups seek to prevent a repeat of the 2008 slaughter of over 1,400 wild bison captured on public wildlands near the border of Yellowstone National Park in Montana. Many of the same factors that contributed to the mass slaughter in 2008 – heavy snowpack, bison population size, and the continuing agency intolerance for migrating bison – are in place this year as well, the plaintiffs say. 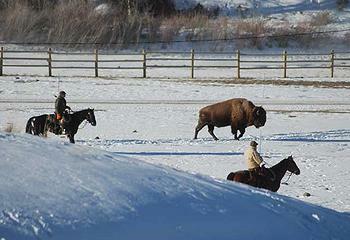 With the Stephens Creek bison trap inside the park near capacity, and more bison migrating toward their natural winter range in Montana to forage at lower elevations, Park Service spokesperson Al Nash indicated that the agencies may begin sending hundreds of bison to slaughter whether they carry the disease brucellosis or not.